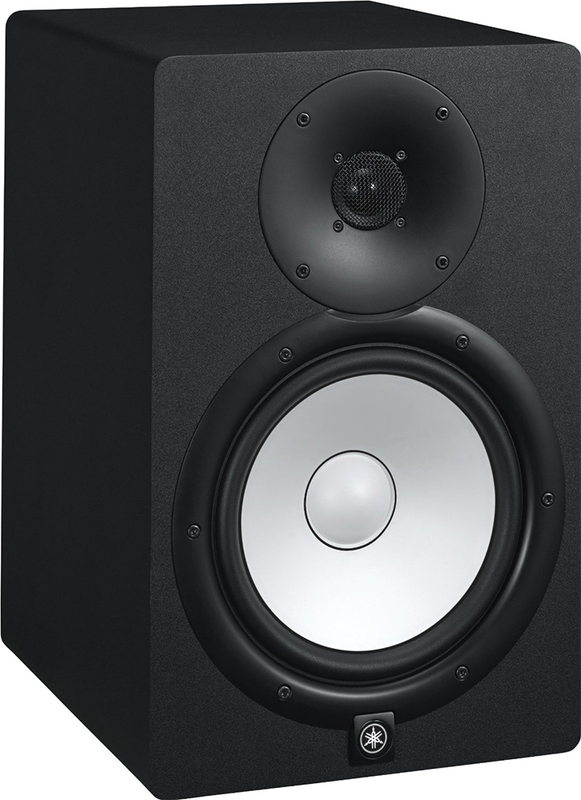 Today we review the best studio monitor speakers for your home, semi-pro or even professional studio, whether you’re on a budget or have saved up a decent chunk of money. Studio monitors are exceptional in terms of sound accuracy, particularly geared towards musicians and producers mixing or mastering tracks. As opposed to typical market speakers by the popular brands we see on TV, most of those either up the bass or treble frequencies or pay less attention to driver detail in order to appeal to the larger market. Monitors battle this by giving you the truest form of sound the artist intended for us to hear, evenly distributing their frequencies among the drivers and providing some powerful amplifiers built-in to their compact size. 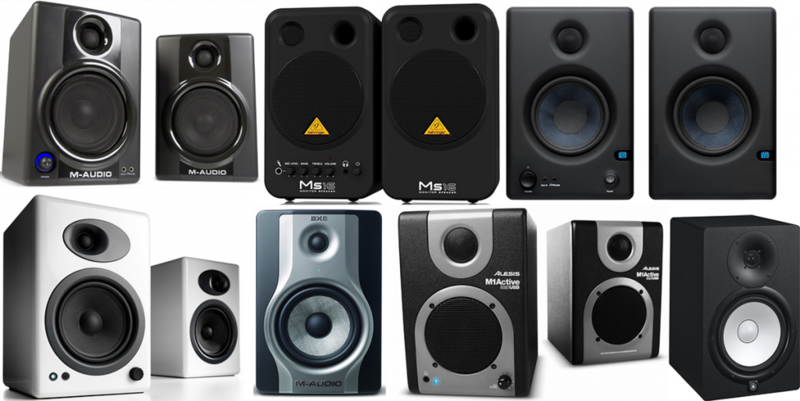 Let’s review the top 10 best studio monitor speakers available today. You’d be surprised at how many home studios have beautiful microphones, sets of MIDI controllers, even audio interfaces but lack one of the most important pieces of music equipment: proper sound output. What is your budget? Typically, the more you spend, the more powerful as well as accurate your monitors will be. There’s quite a range when it comes to the best studio monitor speakers, so we made sure to cover all bases for our different readers out there — from high-end to super budget-friendly. 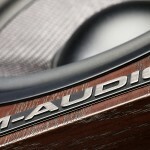 Woofer and tweeter size – The bigger the better? Yes and no — look at the material and make of them as well. The larger they are, the more capacity of frequency they’re able to handle, but if it’s super over-priced with a marketed “big” size, be weary. The overall build and materials used to make the tweeter and woofer are also important (look for carbon and fiber). Do you want a pair or just one? Not sure why we put this in here, but just be careful as some packages only come with one speaker and some in pairs. Unless you only need one, of course. Size of your monitors – Some have a lot of space to work with, others have merely their desk. We wouldn’t let your studio size determine which monitors you should get, so we recommend making room if you have to. If anything, you can also grab some studio monitor stands that accommodate the size and make your setup a bit neater. Passive or active speakers? This passive vs. active speakers article is helpful, but we like active speakers as it is more common so we’ll focus on that for today. Passive speakers will need some amplification (we’re writing a guide on that in a bit), but some prefer those to have some more customization over their sound and power. Do you need a subwoofer? 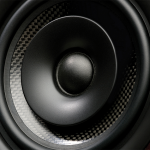 For music production, the consensus is really split with the need of subwoofers. 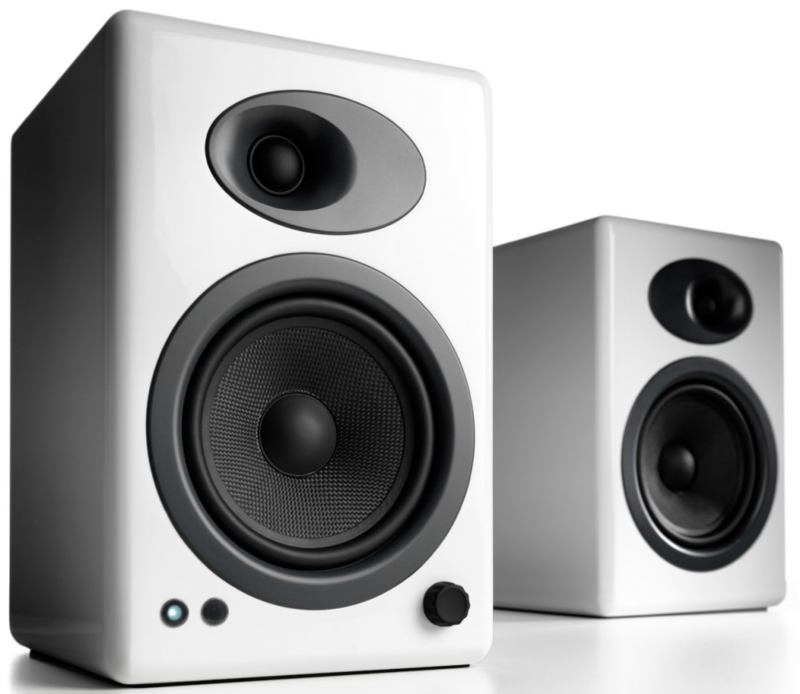 Two studio monitors will be fine in smaller uses and home studios as they give you a feasible amount of that low-frequency sound. We’ve heard many say that if anything, a subwoofer will take away from the sound accuracy and boast the bass if you’re mixing. However, you can always turn the sub off when you want (we do it all the time — we have a love and hate with subs and usually just use it depending on our mood). Read our studio subwoofer article if you’re interested in adding a sub to your setup for times your mood asks for some extra thump. 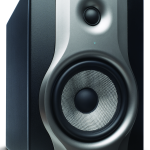 Below is our list of top 10 best studio monitor speakers in the market. We’ve provided models of all price ranges, but have particularly gone for those with the highest positive reviews around the net as well as their overall power, quality of sound, and type of specs in combination of their price. Let’s take a look. To start off our guide, we want to bring one of the heavy-hitters up first to start us off strong. Adam Audio has a big reputation when it comes to high-end audio gear, particularly within the monitoring category. Ask anybody what the “best” is when it comes to engineering and these guys are right there. The A7X in particular is one of their many awesome studio monitors. It provides us with an advanced tweeter (X-ART) with great highs and mids (uncompressed for that raw sound) and solid mid/mid-woofer with 100 Watts PWM amp. The overall build of the Adam Audio A7X is top-of-the-line, coming with a 7″ woofer made of carbon, glass fiber and rohacell. That tweeter we were talking about is handmade in Germany if you fancy the location of creation, and the overall frequency response is quite wide at 42 Hz to 50 kHz to cover all your bases. The A/B amplifier achieves solid power, and although these things come with a price (and typically sold separately so you’ll have to times that price by two for a pair), you won’t be disappointed and be among with the pros with these babies on your desk. Coming in as another one of the best studio monitor speakers ever, Genelec gives Adam Audio a run for their money when it comes to professional and high-end models. The M040 is one of their many monitors worth looking at if your budget allows. This one in particular gives us excellent active crossovers, room response compensation, some “Natural Composite Enclosure” tech, “Directivity Control Waveguide” tech, and amazing optimized amplifiers. So what do these fancy technology terms mean? Well, they don’t just play music. To sum it up a bit, the DCW gives some advanced mechanisms for a wider listening area and improved sound stage\stereo imaging. The NCE on the other hand describes their enclosure build — injection-moulded wood (half wood fibers), flame retardants, lubricants and more. For only those familiar with the advanced builds studio monitors truly come with, it may be the perfect choice. The Genelec M040 is a favorite among the music’s pros, and grabbing two of these will have you set in the audio part of your studio for years to come. Let’s take a huge step down in terms of price-tags. 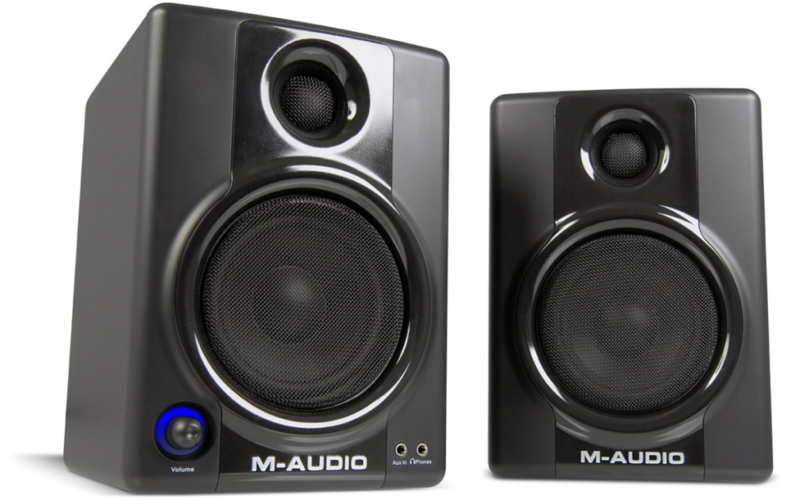 Listed at #3, this pair of monitor speakers by M-Audio equipment has received numerous positive reviews, all stating its dependability in terms of long-lasting stability and accuracy of sound. For the price of a hundred or two retail you just can’t beat the quality it provides if you’re on a strict budget. We figured we’d provide a more budget-friendly pick when compared to the previous speakers if they weren’t exactly your cup of tea. It isn’t necessarily the most feature-packed speakers and their subs/tweeters aren’t massive or high-end — so if you’re looking for a top-of-the-line monitor continue down our list. This is best for budgets and geared more towards the home studio and leisure listening. The frequency response is in the upper-average mark at 85 Hz to 20 kHz, but I really wouldn’t complain with the price. 4″ woofers and 1″ tweeters give it a nice feel in terms of low and high frequencies. 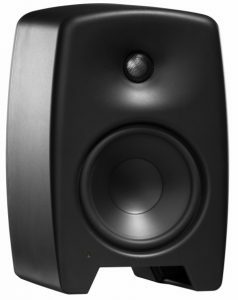 What I particularly like about the Studiophile AV 40 monitors is the additive RF interference protection, not to mention the temperature help, transient and subsonic filters. The only thing we’d recommend is keeping the speakers off when you’re not using them to save their lifespan. Read our full review of the Studiophile AV 40 speakers for more info. I’ve heard so many people talk about the solidity of the LSR305’s that we just had to put these after the AV 40’s. JBL music has been very solid with monitors (I mean, they make PA systems…) and this is their best speaker for music in our opinion. These monitors provide a very accurate and clean sound. The performance is very good, providing a much lower frequency than the AV 40’s (only down to 85 Hz). As a pair they can get a bit costly, but once you grab these you are set for a good 3, 4 or even 5+ years of investment. The woofers are above-average size at 5″ (most are around 4″) and the tweeters are just like all others, although their frequency transducer and image control wave guide help with an even cleaner sound on top of the drivers. If you have the money I’d seriously think about getting a pair of these for any studio. They aren’t necessarily as loud as some competitors (82 watts), but that isn’t always the key when looking for a good pair of studio monitor speakers. 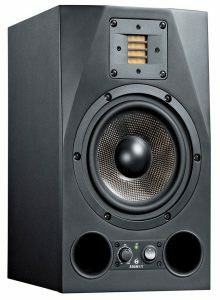 The JBL LSR305 studio monitor is reliable at a pretty doable price. The LSR305 review by MusicTech also praises these for their power and price point. Yamaha music instruments are on point when it comes to speakers. 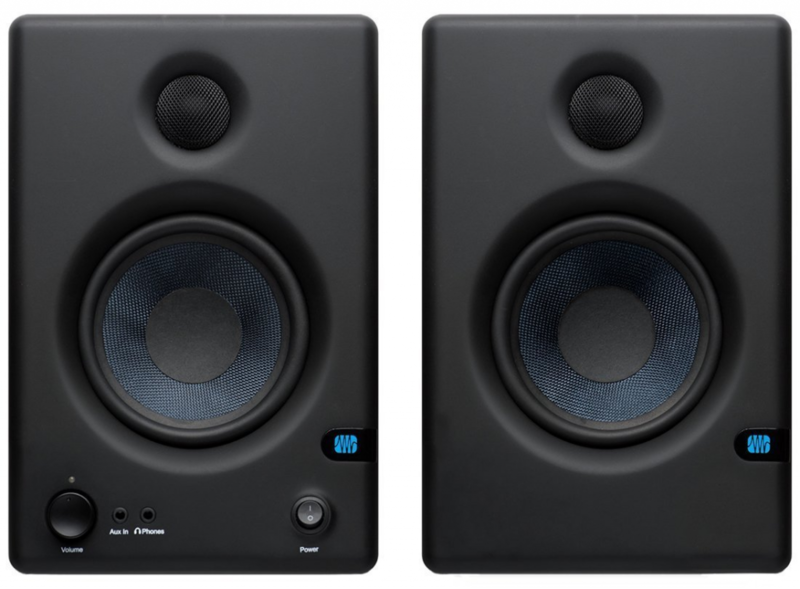 These studio monitors are extremely popular, just falling a bit behind the JBL’s in terms of popularity around the net (probably because they’re a bit more expensive). If you can take a step up in terms of budget, we recommend grabbing these. They’ve got a whopping 8″ cone woofer and a 1″ tweeter (the lower models basically go down in woofer size, hence their model names). The frequency response is above-average and what I particularly like is it allowing you to go down to 38 Hz for bass mixing. The wattage count is very high at 120, so if you turn this baby up you’re getting the walls to feel it in the infrastructure. It’s a bi-amp design so only two-way here, but the mid’s aren’t lacking whatsoever. 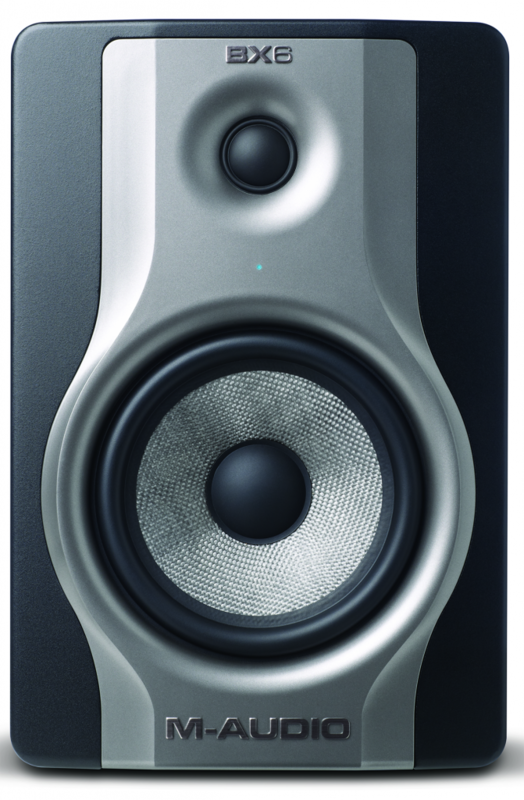 The Yamaha HS8 monitors also have something built-in called the ‘ROOM CONTROL’ which allows for trimming of low and high frequencies for a better, accurate sound based on your liking. Lastly, it’s got a standard XLR and TRS jack but no RCA. These things are beastly and note that they’re pretty damn heavy but hey, what do you expect with something this powerful? These are the cream of the crop. 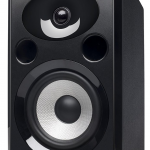 If money wasn’t a factor, these would win for best studio monitor speakers. Alesis recording equipment has always created solid, long-lasting gear in our eyes. The Elevate 6 are brand new and an upgrade from the original Elevate 5 monitors that have received a lot of positive reviews since it’s release. 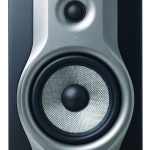 The Elevate 6 active speakers (they also have a passive version we list above but you’ll need an amp for those) features a waveguide that is elliptical as opposed to a straight or even curved, which has been applied in engineering frequently and is stated to give a more smooth frequency range (no sudden drops or peaks at the highs\lows). A larger than normal 6″ woofer and a standard 1″ tweeter here and the wattage is a total of 75 (50 low and 25 high), so they’re not too crazy in terms of shattering windows but are very feasible for most budget-friendly studios. The wood cabinets with bass porting doesn’t hurt either, making these a very solid pair (if you buy two separately) of studio monitor speakers. I would say the Alesis Elevate 6 active speakers are relatively standard but quite low in terms of price with something of this woofer size and overall clarity. The frequency response is very flat so you’re getting a nice, accurate sound to be confident with in your mixes. Here’s a cool video overview of the Elevate 6. These babies are highly regarded in the music equipment arena. KRK Systems make very solid pairs of headphones and monitors. The Rokit 6 have made it to the 3rd generation version and for good reason, offering a bi-amp 1″ dome tweeter and 6″ woofers (glass-aramid composite). Goes up to the standard 35 kHz in terms of frequency response and as low as 38 Hz (same as the Yamahas). The power is about 100 watts but the 20 watt difference between these and Yamaha is barely noticeable in terms of power, so grab these if you want to save a few bucks, although the woofers are 2″ less. 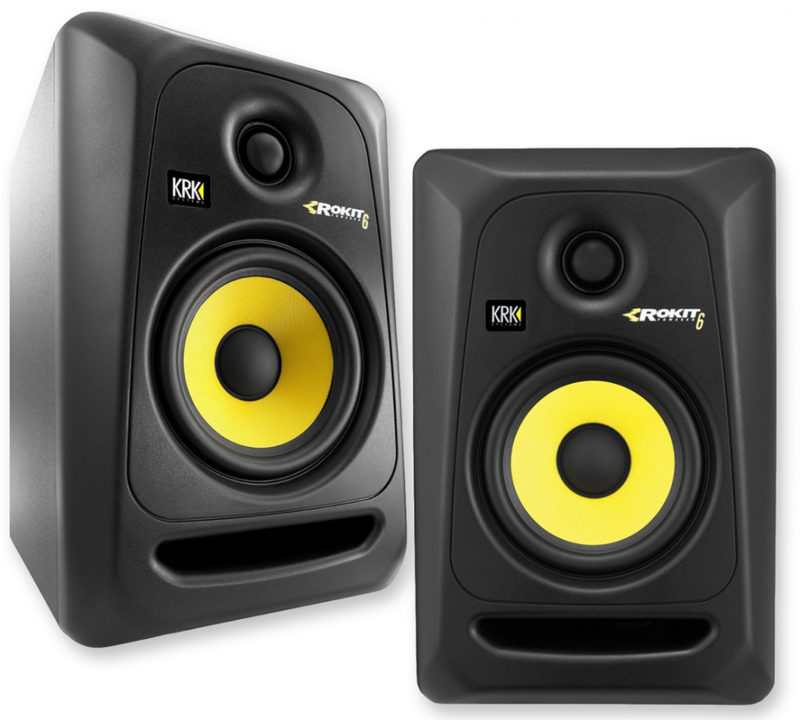 A big plus of the KRK Rokit 6 G3 studio monitors have been stated by many are the especially clear highs. Some have complained about the size being full-sized bookshelf speakers, so take that into consideration if you need to keep space in mind (size really shouldn’t dictate whether you buy these or not — we say make room if you have to). All in all, you won’t be disappointed in these; they are cherished by a lot of gear heads. 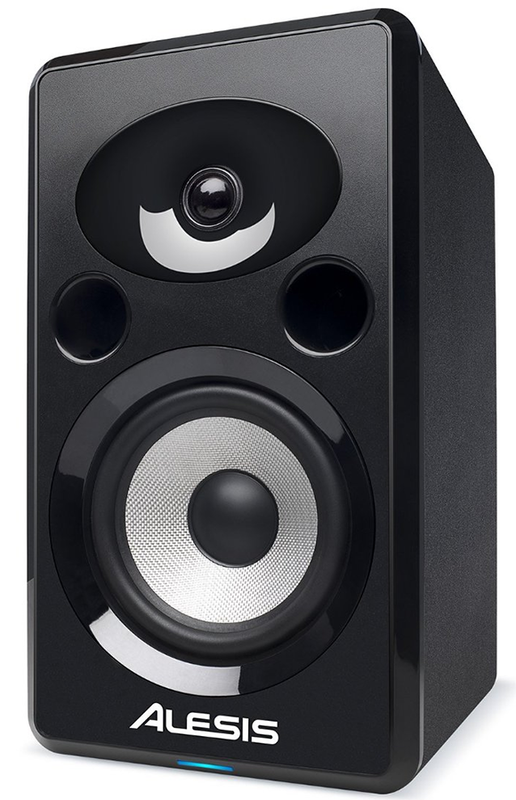 It was either between this speaker or M-Audio music‘s original, highly regarded BX5 D2 studio monitors but we’ve went with their middle-model of the BX Carbon series as it is a personal favorite of ours. 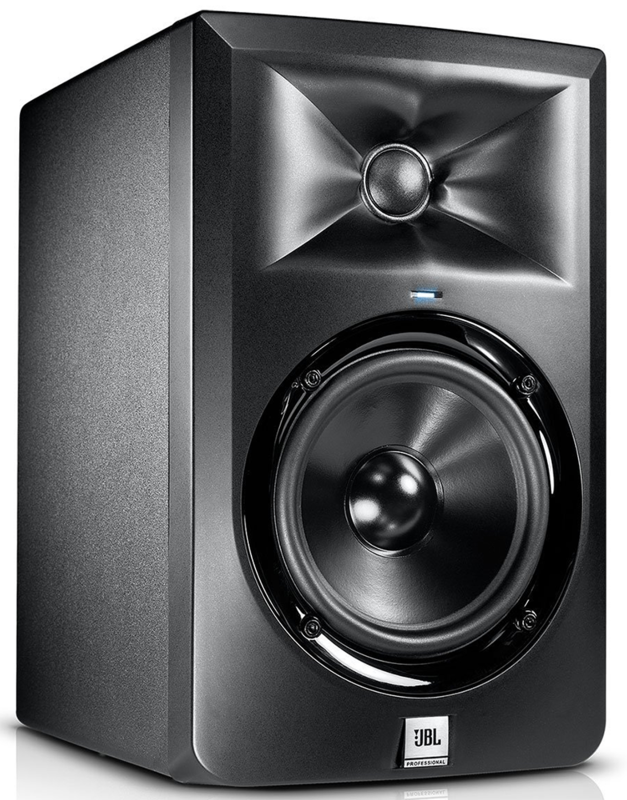 We’ve reviewed all models from their newest studio monitors and just love the accuracy and stability of these. The flat frequency coupled with the 6″ woofer (woven Kevlar — great make) and 1″ tweeters combined with a 130-watt (Class A/B) create a powerful monitor. M-Audio has also included their Acoustic Space Control tech, which lets you have some more control over the mixing environment to adjust speaker placement. The frequency range is not necessarily as wide as a lot of speakers (45 Hz to 22 kHz), but the quality of the woofers and tweeter makes this worth it. Take the BX6 Carbon studio monitor into serious consideration if you have the dough, or you can check out the lower versions (albeit smaller woofers) to save a few bucks. PreSonus equipment flies a bit under the radar, but their equipment is very solid and pretty affordable. The woofers are 4.5″ but are Kevlar, so a bit smaller than a few others out there but made quite nicely. The tweeter is the standard 1″ (25 mm) with silk domes. The amp is only about 50-Watts so it’s around half of the bigger boys out there, but this is also half the price without sacrificing too much besides power. Not that these won’t play loud (they’re more than enough for a small home studio), so don’t let that turn you off. The Eris E4.5 2-way monitor has gotten a lot positive reviews about its near-field listening accuracy as well as praise with their smaller size. No cheap plastic, knobs are made quite nicely — just a solid build altogether. Something to look at in the two Benjamins per pair area, especially if you want something to fit on your desk. 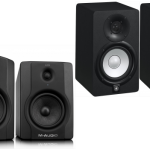 Audioengine‘s make of their studio monitors are great and we definitely recommend going with one of their models. These have been compared against almost every popular monitor out there, so we figured it was for a reason. People talk about these in terms of “saving up for them” as they’re $400 a pair, but they are some of the best in the market we’ve seen. Featuring a decent frequency response from 50 to 22 kHz, the most eye-popping quality is their 150-watts per speaker — the most on our list. If you’re looking for power grab these because they also have very clear sounds in terms of both low and high frequencies (despite the 3/4″ tweeter — they can get away with 1/4″ in our opinion). Amazing sound quality on the Audioengine 5+ studio monitors and if they’re a bit too expensive for you the lower models are listed above. What is the best pair of studio monitor speakers ever?